When you're saying no sign of MusicCabinet anywhere... care to elaborate? Start and log in to Subsonic as usual (normally via localhost:4040) and click the big "Configure MusicCabinet" header link. It should be pretty self-explanatory from there. But after following the process and logging in, no big header link was visible. Here's a snapshot of Subsonic after I log in. I've tried Chromium and Firefox but do not see a header. Might I have missed something? I did a bit more research and started from square one. I suspected that I might have an incomplete/incorrect installation of Postgresql. Still, a note on the page indicates that "PostgreSQL is available in all Ubuntu versions by default." postgresql-contrib is already the newest version. Based on the info above, it appears Postgresql is succesfully installed. 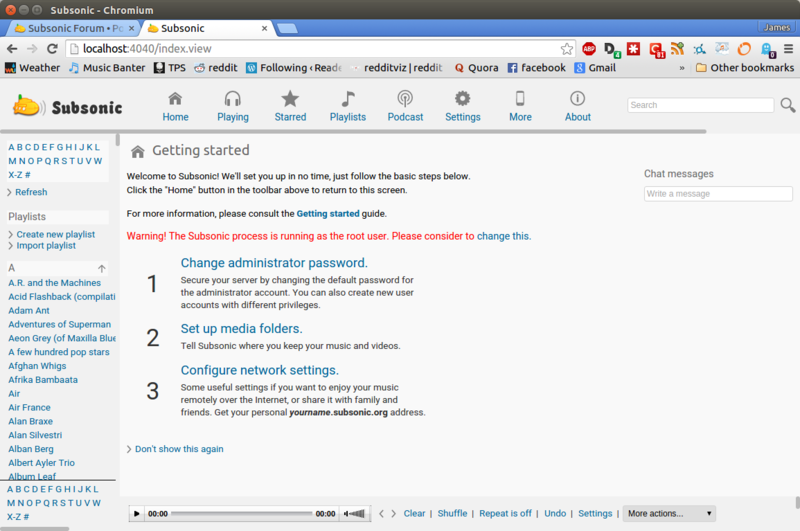 guisar's instructions (posted to this thread Tue Jan 15, 2013 2:15 pm) direct the user to set up their Postgresql pwd next. Entering sudo -u postgres psql template1 successfully takes me through each of the subsequent steps to set up a password. I made sure to replace the two specified files as instructed, then restarted Subsonic and logged in. Still no MusicCabinet menu and the Subsonic log is as per usual.